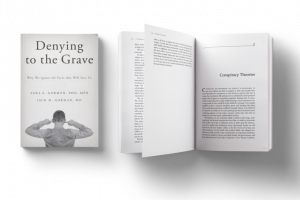 Dr. Woodard interviews Sara Gorman, PhD, MPH about her book “Denying to the Grave: Why We Ignore the Facts That Will Save Us” to help discover the psychobiology of beliefs and decision making with emphasis on health decisions. Suggestions for all of us to improve our decisions on health issues will be discussed. based in New York. Her book, Denying to the Grave: Why We Ignore the Facts That Will Save Us, was published by Oxford University Press in September 2016. The book examines the psychology of healthcare decision making and theorizes about public perception of risk. It includes tips for the general public about how to discriminate between valid and invalid science and pointers for public health professionals and doctors on how to communicate with people who don’t believe what science has taught us about health.